What comes to mind when you hear the phrase client experience? You may think of events designed to entertain and wow your clients, or perhaps you picture regular meetings, check-in calls, and the appearance of your office space. Whatever your thoughts, if you’re like most advisors I talk to, the client experience is designed to have specific results: retention and referrals. Rarely have I heard advisors describe the role of trust in client retention—although trust is the focus of each and every client experience. This includes trust that you understand your clients as individuals, trust that you know what really matters to them, trust that you know how to help them get where they want to go, trust that their best interest is at heart, at all times. After all, without trust, there is no retention or referrals. The 2017 Edelman Trust Barometer shows a world in crisis. Two-thirds of countries surveyed by the global communications firm are “distrusters” of the four main social institutions: business, government, media, and non-government organizations. 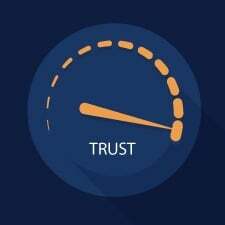 Edelman makes the point that trust is a forward-looking measure; it predicts whether people will find you (and your firm) credible in the future. 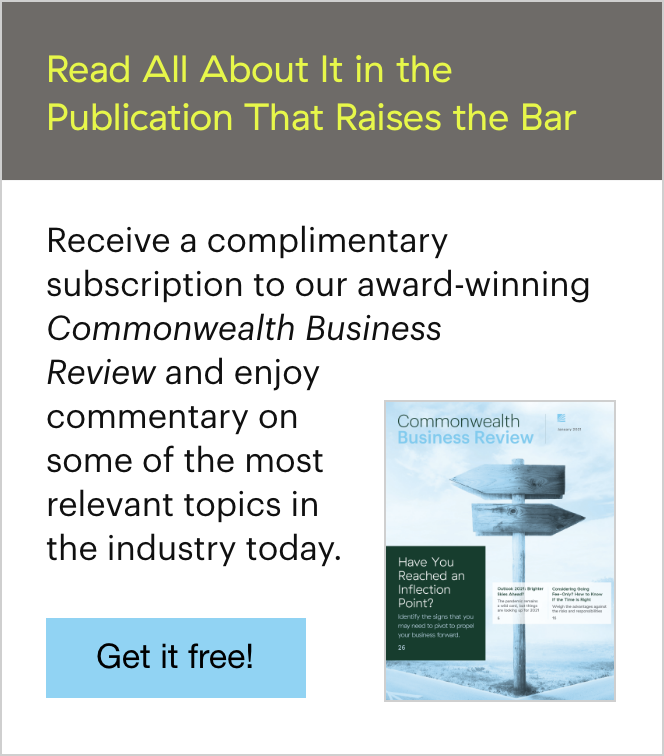 In contrast, reputation is a backward-looking measure, based on your firm’s historical behavior. 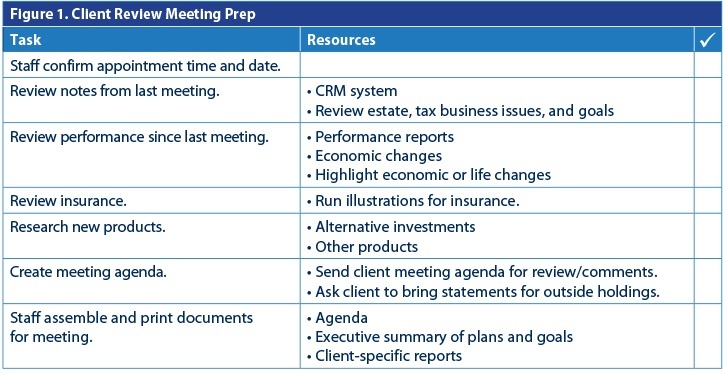 To illustrate how your employees can play a key role in strengthening trust with your clients, let’s consider a typical prep process for a client review meeting (see chart below). Once your clients arrive for their meeting, think about how they are greeted and whether care is taken when they are transitioned from your staff to you. Here, it may be appropriate for a staff member to give you a brief summary of what's new and pressing in your clients' lives, even if that update was previously provided. Doing so demonstrates to your clients that the staff person heard them and that you and your staff have clear channels of communication. Thinking about ways to deepen and strengthen the trust bond is important throughout the life of the client relationship. 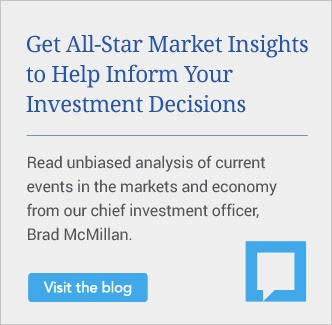 But pay particular attention after the end of the first year of their time with you through their fourth year: Clients are most likely to leave their advisor during this period of time, according to a recent PriceMetrix white paper. Small clients are less loyal and more likely to switch advisors. Advisors have a tougher time holding on to low-priced, fee-only client relationships and high-priced, transactional-only relationships. Firms migrating their business to fees may want to keep transactional accounts as well, as firms with clients holding both types of accounts have better retention rates. Advisors face the risk of losing clients if their prices are too high and if their prices are too low. Some clients will equate low prices with low value. Large clients, however, are less sensitive to price than are smaller clients. Advisors find that they are more likely to retain older clients than younger clients. Clearly, pricing and service model are critical. If clients believe that they are paying a fair price for the value received, this will carry great weight in the trust they give to you. But if they feel a disconnect? No matter how well everything else runs, the relationship is likely to suffer. As you look ahead to the rest of 2017 and beyond, take special care to consider how trust—your clients’ trust in you and your trust in your clients—is expressed. Identify opportunities to strengthen and deepen the trust bond so that you and your clients can commit to a relationship for the long term. How do you demonstrate trust in your clients? Do you have a client advisory group? Please share your thoughts with us below!